The Eleutherodactylus as known by its zoological name, or Coqui as it is commonly called, exceeds the creature itself in length. The genus Eleutherodactylus, with over 700 species, is probably the most speciose genus of vertebrates (Crother 1999). More than 17 different species are endemic to the island, 13 of which occur in the Caribbean National Forest. 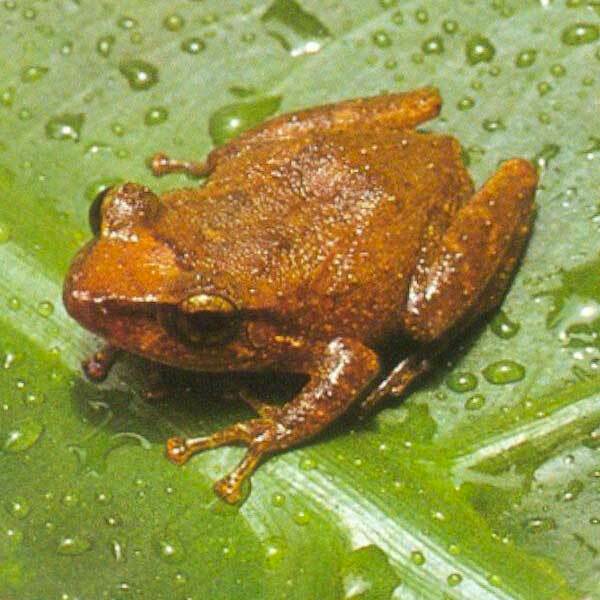 In 2007, a new species, the Coquí Llanero, was officially named Eleutherodactylus juanariveroi. Other species of this genus can be found around the world: in the southern United States, Central and South America; and the Caribbean. This little frog has only a minute tail when it is born, and this quickly disappears. Its length ranges between 15mm-80mm and the color of the coquí varies considerably - green, brown and yellowish, sometimes having touches of different colors or two dorsolateral stripes. The genera Eleutherodactylus, which in Greek means free toes. As the name indicates, this genera has no inter digital membrane, which could indicate that they are not adapted to swim. All coquies have disks or pads on the tips of their toes, to help them adhere to surfaces, like moistened leaves. Coquis reproduce year-round in Puerto Rico, but breeding activity is concentrated in the wet season. This species utilizes internal fertilization and like other eleutherodactylids, the fertilized eggs undergo direct development, rather than passing through a free-living larval (tadpole) stage, which means the parents don't have to lay their eggs on water, as it happens with other amphibians. The "tadpole" stage occurs entirely within a terrestrial egg, rather than as a free-living larval stage, and adult features form directly, sometimes bypassing the stages normally present in tadpole ontogeny (Hung and Elinson 1996, Hanken et al. 1997). Thus, a tiny but fully functional froglet hatches directly from the egg. Coquis deposit 4-6 clutches of about 28 eggs each (range 16-41) per year, with a development period of 17-26 days. Males guard the eggs to keep them from drying out and remain in the nest for a few days after they emerge. The coquí is a very popular creature throughout the island and enlivens the evenings with its timid ko-kee from which it get its name. The coquies begin to sing when the sun goes down at dusk, singing all night long until dawn. The male coquí sings, not the female. You can find the coquí nearly everywhere, from the margins of the forests where the areas receive large amounts of moisture, in highlands, lowlands, dry and arid places, even in caves depending on the species. The coquí has been a cultural symbol of Puerto Rican history for centuries. Since the time of our native Taino inhabitants and its presence shown on many stone engravings to the present and all the places and objects you will find this symbol represented. It has become a national symbol and an icon for anything Puerto Rican. When Puerto Ricans want to express their nationality, they say: "Soy de aquí como el coquí" (I'm as Puerto Rican as a coquí).